Understand the structures and histories of COE, NAEOP, and TRIO State Associations. Have a broader understanding of the history of TRIO and the programs under the TRIO umbrella. Meet and collaborate with leaders within the NAEOP community, particularly members of the NAEOP Board of Directors. Have a concrete “Board” project and a development plan that will be worked on during the year with the ELI cohort. Develop a fundamental understanding of one’s own leadership style and how to effectively use it to work with others. Membership - Candidate must be a current NAEOP project member. If selected, participants must maintain tenure of paid membership in NAEOP. Leadership Potential – Candidate must have worked for a TRIO program for at least two years and show present success or future potential for success in leadership positions and assist in recruiting future ELI participants. Commitment – Candidate must agree to attend all ELI training sessions, volunteer in some capacity at the NAEOP Regional Conference, and be committed to the possibility of furthering their leadership commitment by serving on various committees with the state or region. The applicant will participate in a Board Project over the duration of one year and be expected to communicate regularly and participate fully. Supervisor Support – Candidate must obtain a letter of support from their supervisor. Financial – Candidate is responsible for conference registration fee, lodging, travel and per diem to attend the full day of training. ELI participants will be selected by mid-August to provide ample time to register for the NAEOP Regional Conference early bird registration. If you have questions about NAEOP Project membership, please contact NAEOP Treasurer Angie Klimko at treasurer@naeoptrio.org. For more Information: If you have questions regarding the ELI program, you can contact the ELI Co-chairs, Eric Juenemann at eric.juenemann@mhcc.edu, or Kelly Foran at kforan@alaska.edu. The nomination period is open for the NAEOP Dr. Arnold Mitchem Leadership and Advocacy Award. The deadline for submitting nominations/nominee statements is August 1, 2017. All those nominated and the winner will be announced at the NAEOP conference on the night of October 19, 2017. The Dr. Arnold Mitchem leadership and advocacy award recognizes a member of the NAEOP community who demonstrates a steadfast commitment to low- income and first generation students and exercises vigorous and influential leadership in the TRIO community at the state, regional, or national level. The award recognizes the long and steady tenure of Dr. Arnold Mitchem who guided the Council for Opportunity in Education (COE) for more than 30 years in Washington, DC and across the landscape of higher education. Guidelines for nominations include: 1. 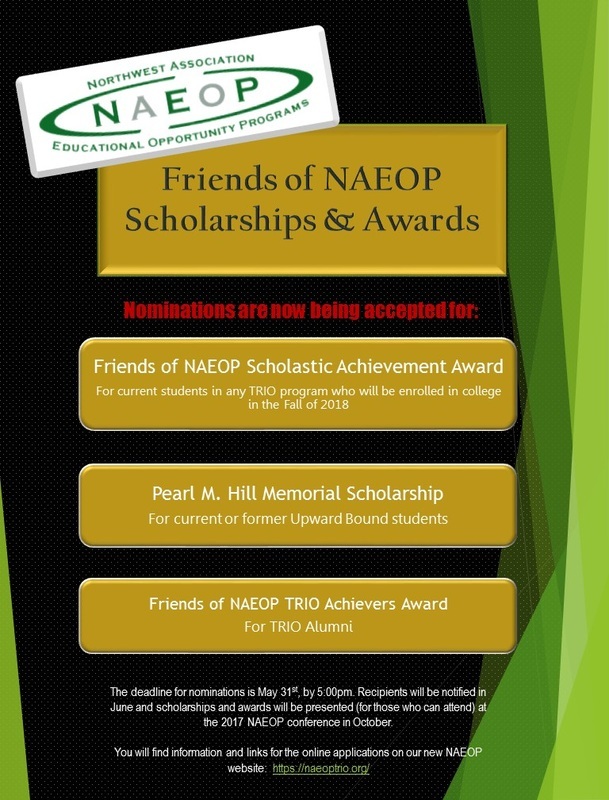 Nominations can be submitted by current NAEOP members only. 2. Nominees will be required to submit a one-page statement of credentials for the NAEOP Board to review. The statement will ask nominees to describe how their work meets the Spirit of the Dr. Arnold Mitchem Award. The NAEOP Board determines the recipient of the Dr. Arnold Mitchem Award. A recipient can only receive the award once. Past NAEOP winners include: 2014 - Phillip Dirks 2015 – Marc Coomer 2016 – Sebastian Myrick Please submit nominee statements to the email president@naeoptrio.org no later than August 1, 2017.